Module_Startup and Module_Shutdown are special pieces of code that are automatically created by Revit when you create a new module. 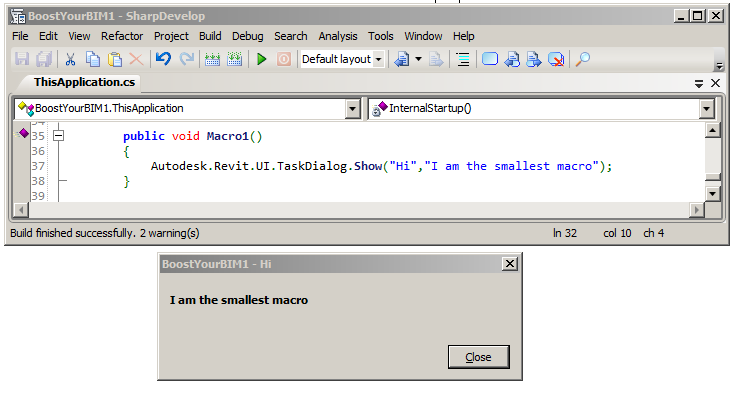 Their purpose is to give you a way to automatically run code when Revit starts and just before Revit exits. Module_Startup code is also executed every time you compile the module. By default they are empty and have no code that they run, and in most cases this is fine. When a sample on this blog requires Module_Startup code (like https://boostyourbim.wordpress.com/2013/02/14/set-adaptive-component-parameter-values-with-placement-point-coordinates/where it is used to register Dynamic Model Update triggers) I will include the startup code in the blog post. You can copy that startup code into your existing startup method, or replace your existing startup method with this new one. But if you paste the new Module_Startup code and leave your existing Module_Startup code that will cause the error that there is already a Module_Startup in that module. Good idea and good job to do a Revit Programming 101 course. It will certainly help a lot of people trying to learn by themselves from blogs and forums. Hi Harry, thanks for letting us know there should be only one module_startup and one module_shutdown. However, does module_startup have to be at the beginning of the code and module_shutdown be at the end of the code? Or can they exist anywhere in any order?